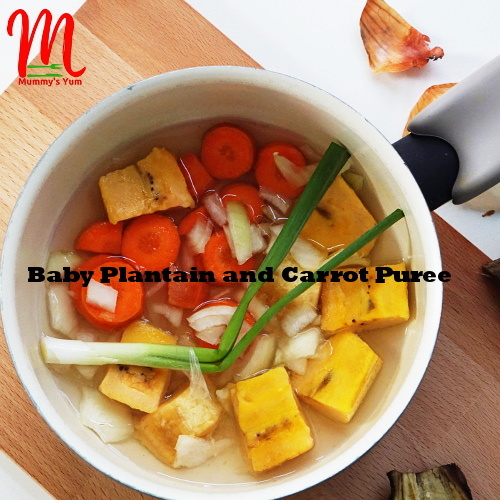 Simple meals like this plantain and carrot meal (suitable from 6 months) are somethings to try for your baby without breaking the bank. The difference between this and that jar of baby food you bought from the shop is taste and freshness. If you doubt me, compare the two after making this and I bet you your baby will not touch your ‘posh’ jar again 🙂 Check my Instagram page if you doubt me. When I was making this, I was wondering what I would do with it since my baby has grown past puree and may not look at it. I was wrong, she ate everything, so I made another batch which I stirred into spaghetti for her lunch. The taste was absolutely fantastic and that is why I call it delicious… Yes, I ate some (hahaha!). You can make this puree and mix it into other meals for your toddler for a delicious and different taste. 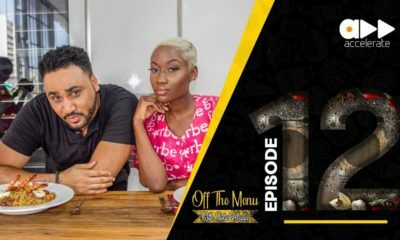 Cut plantain, carrots, onions and liver into small chunks. Put all ingredients in a pot and add water. Bring to a boil until cooked. Puree with a hand blender till smooth. Add more water to get a lighter consistency if desired. 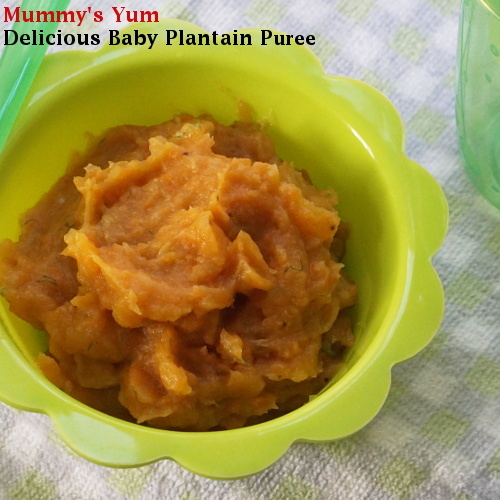 Try these other delicious plantain combinations for your baby with green vegetable or with potatoes and fish. 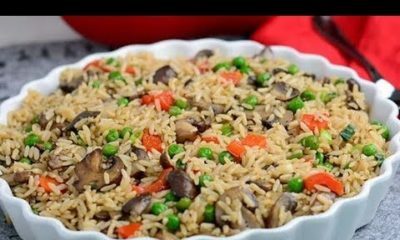 See more Mummy’s Yum recipes here. The transition should be gradual, puree to puree with chunks(semi-solid) , then solids… maybe from 1 year,the baby will determine the pace. The important thing is to ensure that the food is healthy and balanced. Kilipot, from at least 8 months, you can mash rather than puree. Mashing helps babies learn how to chew as well as develop their jaw bones. From soft lumps, you move higher (lol)…hope you get it. At 1 year, baby should be eating proper solid and no more purees. If you doubt me ke? Fresh foods made from the scratch will always top canned or whatever foods in the jar. Be forming posh, even most Americans are trying to go green meaning more healthy. You think it’s better? It is WAY better. Imagine canned tomato paste vs fresh tomatoes. Those can purée taste nasty and weird. There’s no way it can be all natural. They have to add things to preserve it in the can that throws off the natural taste. From sweet potatoes, carrots, avocados, fruits etc I do it from the scratch for my twins. They love it too. I put them in small bowls stack them up in the fridge. It’s time consuming, but I don’t mind going through the hussle. Hubby and I take turns, he actually does it majority of the time. I told my sister in law in Nigeria what I do, she said Deola you are wasting your time, and you are in America where everything is packaged for you. O yes Morayo, homemade are 100% better. I tried the shop jars, ditched them and started making mine. 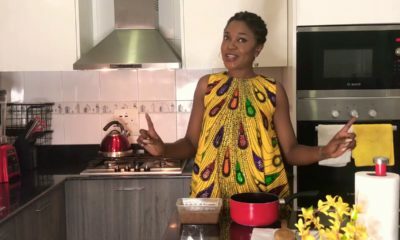 It made me know what i’m giving my baby, as well as incorporating Nigerian foods to their meal. Hi Cheryl, i am not an authority in this subject…but what i do is ensure that the puree is consumed within 12hours….anything outside of that is refridgeratèd. You can also place an ice-pack in an insulated bag while transporting the puree to creche. Hi Cheryl, i just want to add this to AAsh’s correct response especially if using an icepack which will make the food cold by the time your baby will be fed, If the creche has a heating facility to warm the food, then that’s ok, otherwise, you can make the puree thicker than normal, then put a flask of hot water, which they can use to dilute the puree as well as bring it to a warm temperature for your baby to eat. I hope this helps.